MONICA GREWAL became intellectual property partner at WilmerHale in 2004. 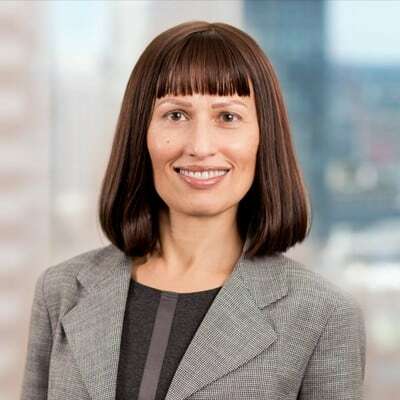 She is director of the Patent Trial and Appeal Board Bar Association, and President of the Board of Governors of the Boston Patent Law Association. She co-chairs the Diversity Committee at WilmerHale. As a former engineer, her IP expertise includes biomedical devices, computer engineering, software, semi-conductor fabrication, imaging technology, and other electrical and mechanical disciplines in Federal and international courts. As an engineer with United Technologies, her work involved United States space programs, including the advanced testing of the NASA spacesuit and shuttle environmental control systems. She received honors for exemplary contribution to the NASA JSC Crew in 1995 and the 1994 STS 61 Hubble Telescope Repair Mission. Ms. Grewal is a first-generation Indian-American.